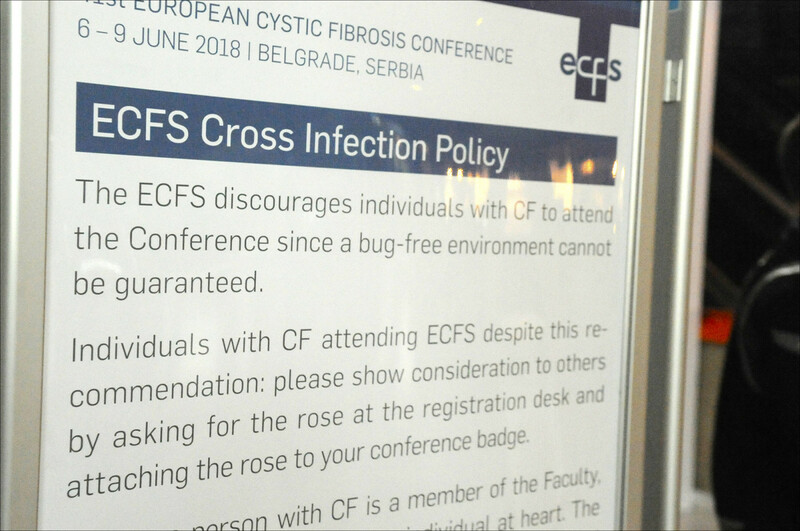 Europe’s largest annual gathering of cystic fibrosis (CF) experts ended June 9, capping four days of speeches, workshops, and poster presentations that attracted 1,832 participants from 56 countries. 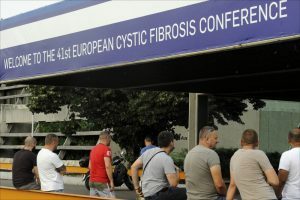 The largest contingents at the 41st European Cystic Fibrosis Conference, held in Belgrade, Serbia, came from the United Kingdom (304) and Serbia itself (138); followed by France (131), the United States (122), Germany (113), Italy (106), and Belgium (93). That’s according to the European Cystic Fibrosis Society (ECFS), which organized the event. French pulmonologist Isabelle Fajac, MD, PhD, took over the society’s presidency from her predecessor, Kris De Boeck of Belgium. The conference featured 30 symposia, 20 workshops, six ePoster sessions, and dozens of specialized meetings on an array of CF-related topics including nutrition, fertility, aging, mental health, and exercise. The event itself took place in the aging Sava Centar, a communist-era building constructed in 1977 by Yugoslavia’s longtime dictator, Josip Broz Tito. Its inadequate air-conditioning and deteriorating façade are emblematic of the challenges facing Serbs today — particularly those with rare diseases like CF. “The tradition of caring for CF patients in Serbia goes back to the late 1960s. However, the continuity of CF services development was interrupted by unfortunate historical events in the ‘90s,” Dragan Djurovic, president of CF Serbia, wrote in a welcome letter to meeting participants. Serbia still lacks a formal CF treatment center, even though its population of adults with CF is expected to rise by 168 percent between now and 2025. Fajac noted that the ECFS Patient Registry has now grown to 44,719 patients from 31 countries — with new participation from non-EU member states such as Albania, Armenia, Bosnia & Herzegovina, and Georgia. She added that the ECFS Clinical Trials Network (ECFS-CTN) will see a new wave of expansion — the third since the network was launched in 2008 — from 2018 to 2020. The network currently provides access to 43 large CF centers in 15 European countries. 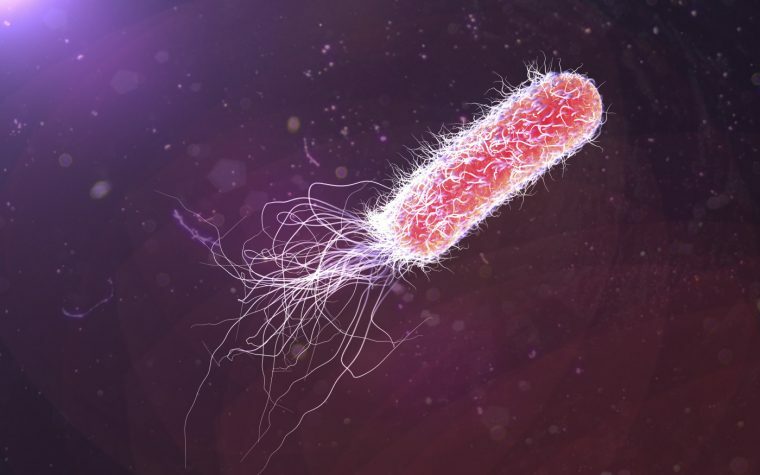 Stuart Elborn, MD, of Royal Brompton Hospital and Imperial College London, noted that in the 1940s, babies born with CF usually didn’t live longer than a year. Thanks to effective therapies and treatments, however, life expectancy has improved dramatically. For example, he said, 71 British women with CF had babies in 2016, and 48 British men with CF became fathers that year. 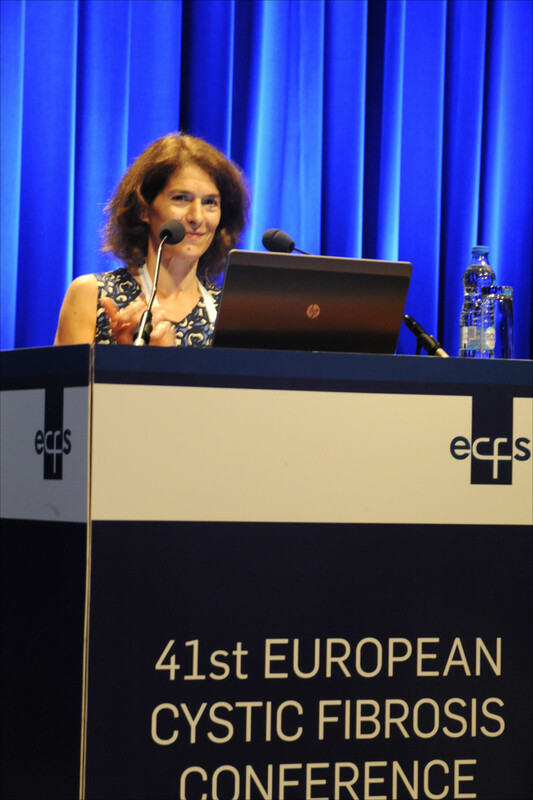 The ECFS, which is headquartered in Denmark, also bestowed its 2018 ECFS Award on Susan Madge, PhD, a British CF specialist who began her 30-year career at London’s Great Ormond Street Hospital and has been with Royal Brompton Hospital since 2002. 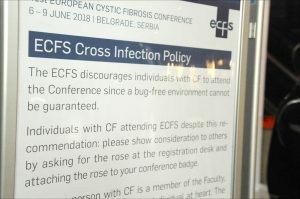 Sign warns of infections at ECFS conference. Madge launched the International Nurse Specialist Group in 1998 (now the ECFS Nursing SIG), and has worked for years to raise the profile of nursing and allied health professionals within the CF community. She is the only non-medical doctor/scientist to have served on the ECFS board, having been elected to four-year terms in 2006 and 2010. The ECFS has scheduled its 42nd European Cystic Fibrosis Conference for June 5-8, 2019, in Liverpool, England. Tagged #ECFS2018, ECFS Clinical Trials Network, European Cystic Fibrosis Society, registry, Serbia. 1832 compare with 2400 in Seville is not too much. But sessions were exellent. Thank you!